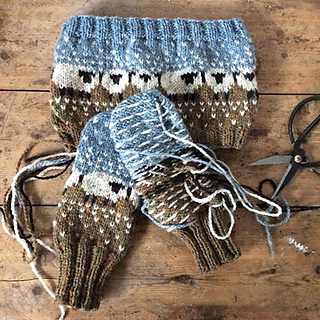 These mittens and cowl have been designed to go with the Baa-ble hat, the pattern I designed and was used as the official hat pattern for Shetland Wool Week 2015. The set is knitted in Jamieson’s of Shetland Heather Aran weight 100% wool and are knitted at a fairly tight gauge to keep out the wind. The original design was inspired by my surroundings in the winter – the sheep and colours of the croft I live on in Shetland. The cowl can be knitted as either a shallow version or a deep version and charts are given for both. Note: To knit both the mittens and either the shallow or deep cowl you will need yarn in the total quantities: Shade A, 2 x 50g balls; Shade B, 2 x 50g balls; Shade C, 1 x 50g ball, Shade D, 2 x 50g balls.